On 9 April, less than two weeks after the explosions in the Moscow metro, the words “black widow” were all over the Russian and foreign press and rumours were actively circulating that 1,000 widows and sisters of dead militants had already been recruited by the North Caucasus underground movement. At that moment the newspaper Komsomolskaya Pravda made an unexpected move and published the names of 22 Dagestani women from the “risk group” -- in other words, women the Secret Services considered might become suicide bombers in the near future. To make it easier to recognise the potential “criminals”, the editors published their photographs and their current addresses. “Forewarned – forearmed”, as the popular saying has it. The Republic of Dagestan is a federal subject of the Russian Federation, located in the North Caucasus region. For Gulya the Komsomolskaya Pravda article was hardly a bolt from the blue. 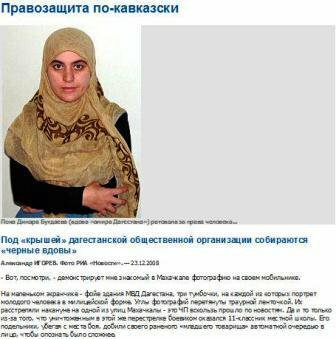 In December 2008 the newspaper had published a whole lot of information about the organisation “The Mothers of Dagestan for Human Rights”: Gulya’s family was graciously described as the group’s family-run recruitment department. The organisation itself was said to be the only group in the republic offering assistance to the victims of torture or kidnapping and relatives of the victims of extrajudicial killings -- a recruitment centre for the underground under the guise of a human rights organisation. Komsomolskaya Pravda newspaper described The Mothers of Dagestan for Human Rights as a recruitment centre for the underground under the guise of a human rights organisation. One of the women on the “list” turns out to be an old acquaintance of mine. She is Sagadat Yusupova, aged 30. Everyone calls her Aisha. In the Caucasus people are often called names other than what’s in their passport. Late one heavy summer evening Aisha meets us at the gate of the house she has recently moved to with her children. Her Islamic clothing – a dark shapeless dress and a tight hijab – actually suits her: she is tall and beautiful with a round face and bright, skilfully made-up eyes. Aisha smiles and rocks her sleepy 18-month old daughter in her arms. The round-eyed little girl stares shyly at the night time guests. She doesn't remember me, of course, how could she? We met a little over a year ago, when she was no more than 6 months old. A lot has changed in the life of that family since then. At the end of April 2009, Aisha didn't live alone with four small children in her grandmother's house. She and her husband, Eldar Navruzov, the father of her youngest child, were renting a flat the other side of town. But to go back to March 2008 – it was soon after their wedding and Aisha was pregnant. Eldar was kidnapped by secret servicemen. He was brutally tortured in the «6th department», which is the name given here to the Extremism and Criminal Terrorism Department of the Dagestan Interior Ministry. They wanted him to admit that he was a member of the militant underground and had fired at policemen. Navruzov spent 11 months in detention. The case against him collapsed. He came home to make the acquaintance of his 3-month-old daughter. He worked on a building site to keep his family, not a small family, as his wife has 3 children from a previous marriage. But they never managed to live a normal life. Eldar was followed and there were two more attempts to kidnap him. He lost his job – who needs someone who is under the microscope of the secret service, specially if he's a young Muslim Salafi who doesn't shave his beard, prays regularly and considers that everyone should live by Sharia law. «We had no money, which in itself wouldn't have mattered, but there was no life either», explains Aisha. «He had been so persecuted that he became quite timid. He was always wondering when it would happen again. He was afraid even to go out to the toilet, that they might come for him and it would all start again. So we parted last summer, a few months after you came to see us». They didn't have to get officially divorced, as it had been a Sharia wedding, so not registered by the secular authorities. Eldar went back to his parents. Aisha's elderly mother set her up in her grandmother's empty house. Eldar came to see his daughter once or twice, then disappeared. Aisha sometimes sees his mother, who says nothing about her son – and Aisha doesn't ask anyway. He has taken to the forest, rather than waiting for the «next time». Before her photograph was published in the newspaper with the caption that she is the wife of the militant Navruzov, therefore dangerous, Aisha had more or less managed to get her everyday life organised. She got a job in a kiosk selling grilled chicken and took her little daughter with her. The baby doesn't make a fuss and her bosses didn't mind. The pay was miserly, of course, but with that and her mother's pension she had enough to feed and clothe her children. Home, work, children, prayer – Aisha is very religious – and her Muslim girl friends – what more could she want? But after the article and the photograph, everything went to pot. «It all began immediately after the article», explained Aisha. «That evening I worked at the grill until 11.30. I had a heavy bag, so I took a taxi home. In the dark lane outside my house there was a car with tinted windows. After what happened to Eldar, cars like that have a very strong association for me, so I noticed it immediately. I went to my mother's – not far away – and asked two neighbours to come home with me. I was really frightened. We were crossing wasteland, when I saw another car with the lights on and its engine running, but no license plates. A man was standing guard outside my house. He saw I was not alone and disappeared. The cars went away too. << Then the police started visiting my neighbours and setting them against me. One was persuaded to watch me – now she's always looking into our yard and policemen hang round at her house. People turn away in the street, they're afraid to say hello. I no longer go out of the house alone. In the middle of April my boss said 'I'm sorry, but I really don't want any problems.' I had to leave my job. He's a good man, but I understand him, why should his life be made difficult? I got a night job baking biscuits in a bakery. At the beginning I went there once a week, now they've stopped asking. People don't want to get involved and I don't blame them. But why has this happened to me? What have I done? I was just trying to bring up my children. In the middle of the story Aisha's mother, Patimat Rasulova, comes running in. One of the neighbours has told her about the guests and the old lady doesn't want to lose an opportunity – people have come all the way from Moscow, perhaps they'll be able to do something for her daughter and grandchildren! Patimat is over 60. She grew up and lived most of her life in the Soviet Union. She did pray, but did it on the quiet, so as not to make problems. Her scarf is traditional, rather than Muslim, and she ties it at the back, as many women in the Caucasus do. Patimat can't understand her daughter's devotion to religion, or why the children don't go to a traditional school. And how can music and dancing be «haram» --forbidden by Islamic law. Children need to sing and dance, after all. She begs us to persuade her daughter to take off the hijab – her own and her daughters'. Why ask for trouble, when prayers can be said at home, behind closed doors, as people used to do, as she does? «Allah understands everything». Aisha starts protesting that praying should be done in public and that people should live by Sharia law, openly. The ordinary school is too easygoing – she had tried sending her children there, but the girls were told to take their scarves off, and in the breaks they danced the lezghinka, a Caucasian folk dance. She feels that, as a mother, she can't allow her children to be led astray. She has a duty to bring them up as proper Muslims and to show them a good example.